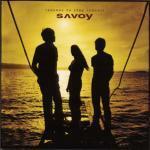 Savoy's fourth album "Reasons To Stay Indoors" was released in Norway on Monday 8th October 2001 and in Sweden on 25th February 2002 (regular edition only). This 12 track album is available as a limited edition double pack containing a bonus 5 track CD. 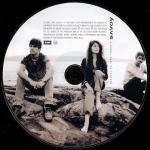 The cover of the album shows a sihouetted shot of the band standing on a jetty in front of bright yellow sunset which is reflecting on the water below. The title and Savoy logo is printed in dark red letters at the top of the sleeve. The 6 page CD booklet includes lyrics to the songs on the album, track information, two band shots and some of the artwork used on the single "You Won't Come To The Party". The reverse of the booklet has a shot of the empty jetty in front of the yellow sunset. On the back sleeve there is another shot of the yellow sunset over the sea, taken from the end of the jetty. A mirror image of this pictue is printed underneath the CD tray and includes a track listing of the bonus disc. 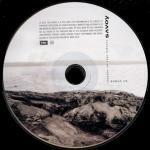 The disc features a brown-tone black and white picture of the band sitting on rocks in front of the water. 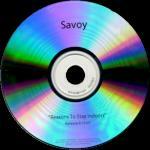 Copyright information is printed at the top of the disc with the title and Savoy logo printed at 90 degrees up the right hand side. The bonus disc features a picture of the rocks where the band were sitting with titles printed in a similar manner. A regular edition of the album was also available. It doesn't contain the bonus disc, but otherwise the packaging is very similar to the limited edition. A third version of the album was available exclusively through www.a-ha.com. It has a slightly different cover compared to the regular release. The album title and Savoy logo have been moved from the top centre of the sleeve to the top right. Apart from that, the sleeve and booklet are almost identical to the regular release. It does not include the bonus disc and does not have a catalogue number as it was not released under the EMI label. The disc is also similar, but is more brown in colour compared to the regular edition. The discs are regular CD-Rs (KODAK and TDK editions exist), some of which have been written on by hand. There exists a test pressing CD-R of "Reasons To Stay Indoors" which comes with a white text printed sleeve. The front of the insert has Savoy, the title, release date (8.10.01) and the EMI logo printed in black text, while the back of the insert has the track list and EMI logo down the centre. Track 6 is listed as "The Fear List" rather than "Fearlist" as it is on the regular release. The disc is plain silver with black text. Another test pressing has a similar cover, but the front sleeve does not mention the release date. In the back of the case, there is a promo sticker which reads «Savoy "Reasons To Stay Indoors" Sperrefrist, anmeldeleser: 28. sept.! Album slippes: 8. oktober Albumet inneholder 12 låter, er produsert av sevenske Michael Ilbert of følger opp 50.000-selgeren "Mountains Of Time". Aktuell single: You Won't Come To The Party». The release date 24.09.2001 and EMI logo are printed at the bottom.